Behind the 7th green and with fabulous views over the golf course stands our latest Woodsome Hall member - 'The Dormy House'. This 8 twin-bedroomed, new addition provides fabulous modern accommodation with communal sitting room. All Dormy House rooms have en-suite and are tastefully decorated with wall-mounted TV's, Wi Fi access plus tea & coffee making facilities . A variety of great value packages are available and can be suited to your specific stay. 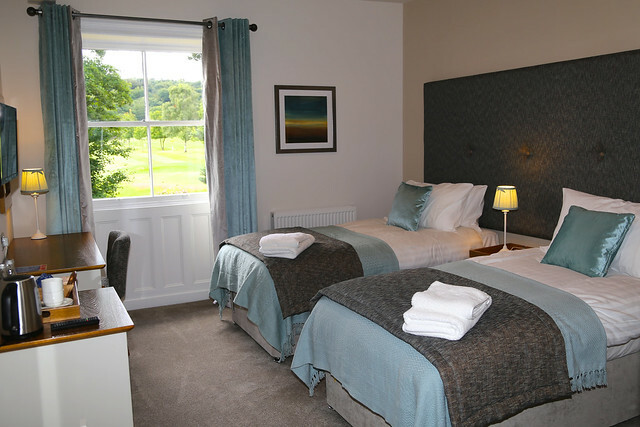 Two rounds of golf plus accommodation with an evening meal and a fabulous English breakfast start at £150 per person. There is also limited availability for our new Sunday Driver deal which is tremendous value at £130 per person. Your golf tour and special rates can be arranged with other Clubs in the area if you wish to stay more than one evening. Take the strain out of making all the arrangements and call our General Manager Dave Carlisle to create your special package on 01484 602739. We have been inundated with enquiries from golfers who booked with us in previous years with many of them having already booked to return this coming season. We now have very limited availability for 2019 Sunday drivers and bookings for May this year surpass our monthly records. The month of September is already proving popular and also has limited availability.